Delbert and Abraham in Chilongo. 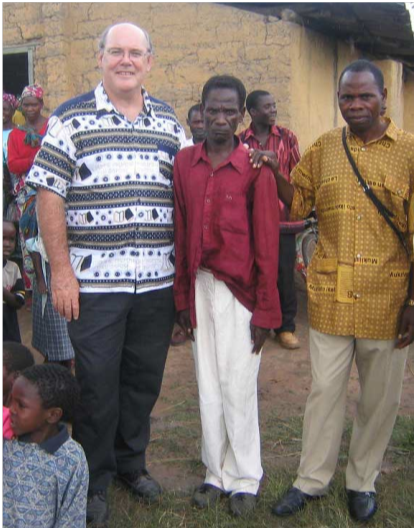 I’m reminded about ten years ago a dear pastor and friend (Royd) encouraged me to help someone that needed a PET Zambia Handicap bike. This person's name was Abraham and he lived about 90km away in a small farming village called Chilongo. Royd said, "Abraham’s two older brothers had recently died and he was physically disabled, unable to walk since a young boy." God kept Abraham on my heart for weeks. Talking to me everyday…"Go help Abraham, go help Abraham." It was getting annoying. It was January and the rains had already come and I was thinking I’d go after the rains. But no…God kept saying, "go help Abraham." So off one day Royd and I went, with a PET bike, to help this person I didn’t know. After driving for hours and getting stuck in this African mud a number of times, we found Abraham’s village and hut. We were tired, wet and dirty, but invited in by his mother we started up a conversation. Abraham didn’t say a word. I think it was the first time he had ever seen a white man up close. I started to talk with Abraham, just trying to minister to him. He was sitting on a grass mat next to his mother with a blanket around him. I was saying all the right stuff, trying to be very pastoral… "Abraham, God loves you and I love you", but after a bit he asked this question, "If God loves me, why would God take my brothers and leave me? I can't even help my old mother in the garden." He was very, very depressed. It was one of those unexpected moments and one of the saddest situations I have ever been in. To be honest, it left me speechless. All I could hear was the Lord saying, "Help Abraham, pray for him… RIGH NOW." So I obeyed and prayed. That prayer was short and sweet and to the point. I prayed, "Lord, you have had this dear man on my heart for weeks, and you brought us out here on this wet, muddy day. It’s time you do something. Lord, break this spirit of depression and do something to bring back purpose and hope into Abraham’s life…. In Jesus name, Amen." I got up and went outside to get the PET off the vehicle. However, before Royd and I could even get it down, Abraham’s mother called out "come quickly…. Miracle - miracle!" As I went back into the hut there was Abraham standing on his feet! His mother said, "I was getting him dressed to bring him outside." As she started to lift him up to put on his pants, he just stood up on his own! "It’s a miracle! ", his mother said. "This is the first time in twenty-eight years he had stood on his feet!" I love watching God work! His mother and others that came running to see just started singing and dancing and praising God! Obey and pray… Tell Jesus everything. PS. Concerning this article... I'm going tomorrow to the village mentioned in the article, where Abraham lived. Going to preach in the morning and hold a seminar in the afternoon on "How to share Christ with someone." The only problem is....it's rainy season again. God has such a sense of humor.